You have six days each week for your ordinary work, but the seventh day is a Sabbath day of rest dedicated to the Lord your God. Rest. He insists on it. God rested on the seventh day of creation, not because He needed it, but because we would need it. Because otherwise we’d find ways to go nonstop in the pursuit of our “ordinary” work. Stopping becomes an act of faith as well as obedience. It’s a sign to us, and to others, of God’s trustworthiness and His care for us. It means we trust Him to help us accomplish the “ordinary” work He has for us in the other six days. Truly resting and trusting means not just stopping the work for a day. It means stopping thinking about the work for the day. Otherwise our minds keep working, and we miss the point. Choosing rest makes us see where our worship and affection really lie – and where they belong. It can refocus us on what’s truly important, taking our focus off ourselves and pointing us back to God. It may reveal a few things that need trimming from our schedules. It also recharges us to return to work with new energy and stamina. Worship is a key part of soul-rest and restoration. Other aspects of a day of rest dedicated to God may mean different things to different people. Without legalism, and with daily resting in His presence as well, how might we expand our understanding of a designated day of rest? God our Creator and our Shepherd, You know our limitations better than we do. You know we need rest of body, mind, and spirit, and You know how we can turn our own agendas into mini-gods if we’re not continually reminded of our true allegiance. Thank You for being the kind of God who rests His people instead of grinding us into the ground. Thank You that You desire relationship with us: our love, not just our labour. Teach us what it means to rest, including how to carve out a day of rest in our fast-paced world. May our obedience be a sign for us and for others of Your goodness. The key to rest is the invitation of Jesus to “Enter the Rest of God,” sung here by Brian Doerksen. This entry was posted in Devotional and tagged Brian Doerksen, Devotional, obedience, rest, work on October 12, 2016 by Janet Sketchley. Subtitled “Small-Moment Living in a Fast-Moving World,” Simply Tuesday calls readers to live in the everyday moments without the pressure to perform or to push on to the next big thing. Even the cover art, a quiet bench with birds and dragonflies, calls us to slow down. Sections consider our home, work, relationships and souls, as well as a vision for what’s ahead. Readers are invited to find ourselves and our loved ones in the present, and to be present to Jesus with us. The book is part memoir and part an exploration of Christian living, shared by one who’s still learning through life (as opposed to one who’s nailed the answers). Emily P. Freeman writes with a transparency and a conversational style that will be familiar to anyone who follows her blog. Something I hadn’t noticed in her blog posts that made the book a little harder for me is the fluidity with which she shifts from past to present and back again. We do this in conversations, to add immediacy: “Fifteen years ago, I’m working at a local high school… It’s morning and the bell rings…” (p. 206) In printed form, I find this jarring. Maybe it’s the editor in me. Simply Tuesday offers refreshment for anyone struggling in the try-hard life while her soul aches for a simpler pace and a bit of fresh air. It’s not anti-performance or opposing busyness. Instead, it’s a glimpse of what life might look like if we began to nurture the small things in our lives and if we accepted ourselves as who we are instead of always pushing to be more than we are. Highly recommended for weary souls. This entry was posted in Non-fiction, Reviews and tagged book reviews, Christian living, Emily P. Freeman, memoir, non-fiction, rest, stress on October 5, 2015 by Janet Sketchley. It’s been a while since I’ve posted links to things I’ve read online that have encouraged or resonated with me. Apparently, there’s a name for this sort of post: curated content. I just call it passing on material that I think you might like. I collected these links a year ago but didn’t do anything with them. It was good for me to go back and re-read these blog posts, because resting and rushing are timeless topics. This entry was posted in Christian Living and tagged Brenda J. Wood, Carolyn Watts, Ginny Jaques, Jeff Goins, rest, rushing on November 21, 2014 by Janet Sketchley. Traffic noise: motors, horns, someone’s booming stereo. Dust. Exhaust fumes. Movement everywhere. We get used to navigating life in the middle of it all. This verse caught my attention, invited me to take a time out. Have you and your spouse talked about something other than logistics–kids, groceries, errands–today? If not, do it now! It’s about marriage, but it applies just as well to a Christian’s relationship with God. We get so caught up in the “traffic” of daily life, the things we’re doing for God. Sometimes we drift into managing our responsibilities in our own strength (we all have stories of how well that works–not!). But even when we’re praying about it, committing the day and its needs to God, working with Him and for Him, it can get to be all about the work. The responsibilities. Yes, we want to please God. We love Him, and He’s given us so much. But it’s easy to forget that this isn’t all He wants. It isn’t even the most important part. Some people schedule a daily “appointment” with God so their agendas don’t fill up and crowd Him out. I start with a morning prayer and reading, but you know, that’s starting to feel like the morning meeting with the Boss. Important, but needing to be realigned. Reinforced. Step one: I need to slow down and enjoy that quiet time. Reflect more on who God is. Worship. Enjoy His presence. Step two: It’s time to go back to having a tea date with God later in the day. No planning the rest of the day, just a pause for togetherness. Maybe with a worship song to help me focus, or maybe in silence. 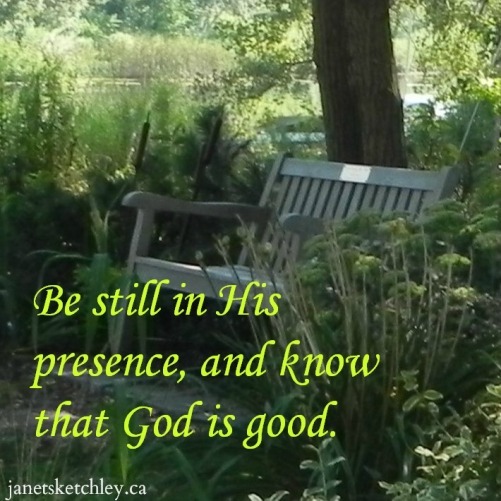 God our Creator and our Shepherd, teach us to be still and to know that You are God. Help us abide in You, delighting in Your presence. Forgive us for what we’ve missed in our frantic pace. Help us to work diligently for You and in Your strength, but help us first and foremost to set our hearts on You and to let everything else flow out of that relationship. This entry was posted in Devotional and tagged Devotional, Michael W. Smith, prayer, rest, Sheila Wray Gregoire, worship on June 4, 2014 by Janet Sketchley. This isn’t a pause or a passing-through. 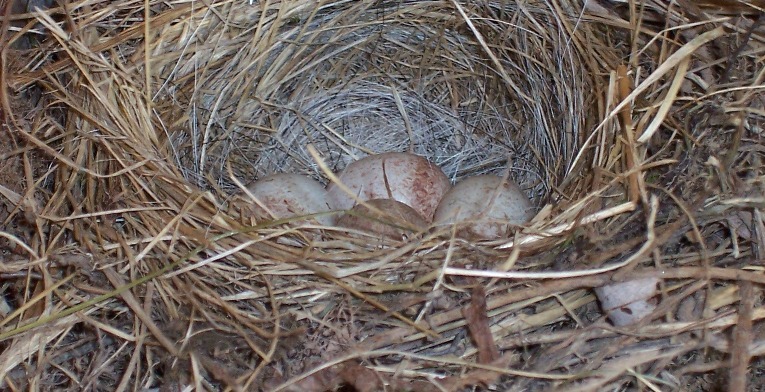 We need to consciously live… abide… dwell… in His shelter. It requires gratitude, confidence in God, hope and trust in Him. It enables us to bring Him our needs as a child to a loving parent: with assurance that He listens, loves and knows best. God who loves us and who is our Good Shepherd, help us live in Your shelter. Your power is great and You are all wise. Teach us who You are, so we can trust You more. Help us rest in Your care. This entry was posted in Devotional and tagged confidence in God, Devotional, rest, Steve Green on October 24, 2012 by Janet Sketchley. Grace Fox shares the secret to a restful sleep. Bonnie Leon reminds us of the peace that comes when we remember God is always with us. Mary deMuth encourages us to Say No. Rest. Reba J. Hoffman, PhD tells us it’s crucial to develop the habit of stillness. This entry was posted in Christian Living and tagged peace, rest on August 17, 2012 by Janet Sketchley. Here are five posts that have spoken peace to me recently. Enjoy! From Mary DeMuth at Live Uncaged: Free People Rest. Do You? From Carolyn Watts at Hearing the Heartbeat: When You Wake Empty and The Only Safe Place to Start Your Week. And from Emily Freeman at Chatting at the Sky: 5 Ways to Breathe in a Breathless World and The Kind of Faith that Changes Your Life. 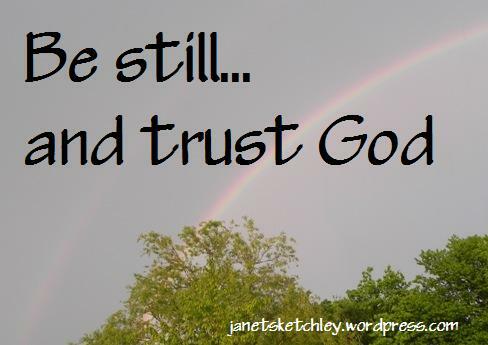 This entry was posted in Christian Living and tagged Christian living, faith, peace, rest on June 1, 2012 by Janet Sketchley.